A Palestinian man has been shot dead by Israeli security forces in the northern Gaza Strip after a day of protests to mark Land Day, Palestinian medics say. The 20 year old reportedly approached the border fence near Beit Hanoun. Activists earlier called for a "Global March to Jerusalem" on Land Day, which marks the 1976 killing of six Arabs protesting against land appropriation. Israeli troops also fired stun grenades and tear gas to disperse stone-throwing protesters near West Bank checkpoints. Hundreds of thousands of Palestinians fled or were displaced from their homes during the Arab-Israeli wars in 1948 and 1967. Mahmoud Zakut was shot dead when dozens of youths walked towards the border fence with Israel on Friday afternoon in spite of attempts by Hamas police to stop them, witnesses told the AFP news agency. The ministry of health said another 37 people had been wounded by gunfire at Land Day demonstrations across the Gaza Strip. The Israeli army made no immediate comment, saying it was only aware of two people being injured by live fire - one near the Erez crossing, north of Beit Hanoun, and another near Khan Younis, in the south. 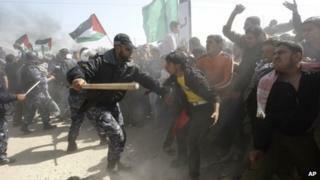 At least 220 people were injured in clashes in the West Bank and East Jerusalem, Palestinian medics said. At least 14 of them were hit by rubber bullets, they added, including a senior official in the Fatah movement. Israeli troops used rubber bullets, as well as tear gas and stun grenades, to disperse stone-throwing protesters at several locations during the day, including the Qalandia checkpoint outside the city of Ramallah. "We are determined to march together toward Jerusalem, and hopefully we will break through and reach it," a masked youth calling himself Rimawi told the Reuters news agency in Ramallah. Palestinian activists earlier called for a "Global March to Jerusalem" to protest against "the policies and practices of the racist Zionist state". "For 44 years this policy of colonialism, which has prolonged the occupation, has been the main source of violence in the region and the single most menacing threat to the two-state solution," said the chief Palestinian peace negotiator, Saeb Erekat. Image caption Palestinian activists had called for a "Global March to Jerusalem"
In anticipation of the unrest, the Israeli authorities closed all crossings with the West Bank until midnight, and said men younger than 40 could not to attend Friday prayers at Jerusalem's al-Aqsa mosque. The Israeli army was also concerned that Palestinian refugees and their supporters in Lebanon and Syria might try to cross into Israel, mimicking two protests last year when several people were killed. An estimated 14,000 people took part in a large demonstration not far from the Allenby Bridge on Jordan's border, but there were no reports of any protesters attempting to breach any fences along the frontier.